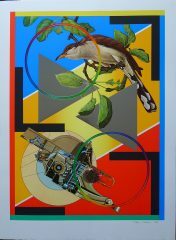 Peter Phillips Painter, pop artist and print maker. He attended the Moseley Road Secondary School of Art in Birmingham and the Birmingham College of Art until 1959. In 1959 that he visited Paris and began to exhibit at the RBA Galleries in London. Phillips did a graduate course at the Royal College of Art in London from 1959 to 1962. His peers were R. B. Kitaj, Allen Jones, D. Boshier, Patrick Caulfield and David Hockney. During his course there, Phillips saw reproductions of work by Jasper Johns and Robert Rauschenberg. 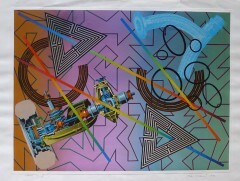 Peter Phillips was particularly aligned to American culture and reflected its commercial iconography and aggressive advertising style in his dynamic montage paintings. One of the most important English POP artists, Phillips taught at the Coventry and Birmingham Colleges of Art in 1962 to 1963. In 1963 he was represented at the Paris Biennial. In 1964 his work was included in the Pop Art exhibition shown at the Hague, Vienna and Berlin. From 1964 to 1966 he lived in New York and travelled in the USA with Allen Jones by car and adopted the custom car as a metaphor for the work of the artist. He had his first one-man exhibition at the Kornblee Gallery, New York in 1965 and was invited to contribute three prints to the first major Pop Art Print portfolio, 11 Pop Artists I-III. From 1968 to 1969 he was guest teacher at the Hochschule für Bildende Künste, Hamburg. He travelled in Africa, the Far East and the USA. In 1972 he had a retrospective at the Westfälischer Kunstverein, Münster, and in 1976 at the Tate Gallery, London. In 1977 he had a retrospective in Milan. In 1981 he visited Australia. In 1982-83 he had a retrospective which was shown at six British museums. In 1992-95 he visited Canada and US for exhibitions in cities including Montreal, Boston, Houston and New York. In 1996, he had exhibitions in Mallorca at the Fundacio Miro and Casal Solleric; in 2002, he was the subject of a career retrospective at Galleria Civica di Modena, Italy and was included in their “Pop Art UK” group exhibition in 2004. In 2005, he was included in the “Metamorphosis” exhibition at the Goulanderis Foundation (Andros, Greece) and the “British Pop” group exhibition at the Museo de Bellas Artes Bilbao, Spain.